Texas is one of the truly iconic states of the USA, evoking images of the Wild West, expansive deserts and western heroes roaming the open range. And with the Texas Eagle, Amtrak can take you right into its very heart. The adventures starts daily from Chicago, winding for 2,102 kilometres (1,306 mi) though the central American states of Missouri and Arkansas and finally into Texas, taking you across the great Mississippi River and through the eastern edge of Ozark Mountains, before traveling southwest through Arkansas. Witness a Texas you didn’t expect, with lush pine forests in its northern region, before reaching the desert lands around San Antonio, where the legend of the Alamo still lives large. The Texas Eagle takes you through major cities like St Louis, Little Rock, Dallas, Fort Worth and Austin, but it continues to Los Angeles after a lay-over (7-9 hrs) in San Antonio, where it merges with the Sunset Limited train from New Orleans. This connection is available three times weekly (on trains 421, 422), increasing the journey from Chicago to almost 4,400 kilometres (2,730 mi). On board, your Superliner Sleeping Car offers the highest standards in comfort, while the renowned Sightseer Lounge Car provides panoramic views of the scenery every step of the way. In the Dining Car, enjoy world-class dining in luxurious surrounds as you speed through the heart of the historic American west. The mile-by-mile route guide is detailed on pages 142-185 the soon-to-be-released USA West By Train: The Complete Amtrak Travel Guide. Coming in Spring 2015! 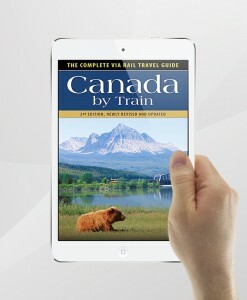 From the best-selling authors of Canada by Train comes the ultimate companion to rail travel in the Western USA. 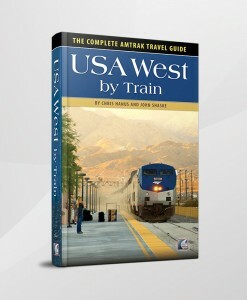 Pre-order USA West By Train: The Complete Amtrak Travel Guide from us now, before it hits the stores!